The authentic Santa Barbara vibe - Spanish Colonial architecture, verdant gardens/grounds and beautiful ocean views - AND we are locally owned and operated! Within walking distance to beach, Urban Wine Trail, downtown dining + shopping! 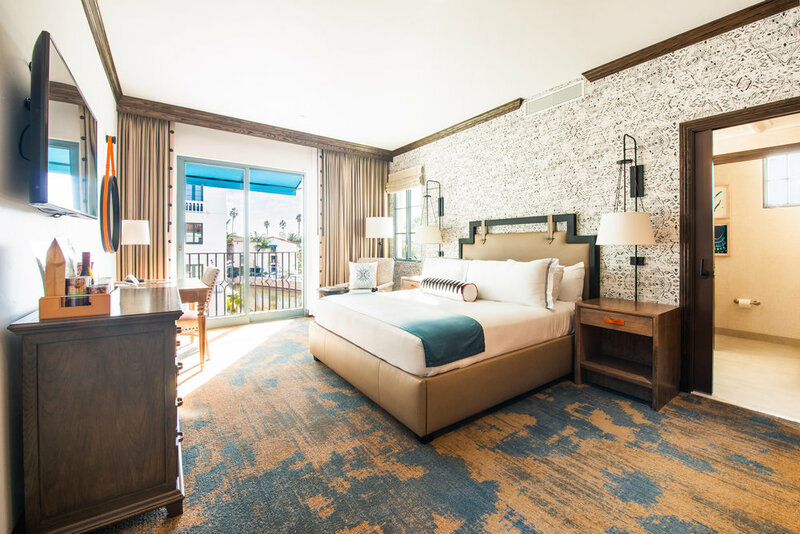 The family-friendly resort style, 4-Diamond hotel provides a location that is ideal for those wishing to experience the best that Santa Barbara has to offer - from the beautiful coastline to the charming shops + restaurants along State Street. Everyone who stays here should walk or bike along Stearns Wharf to take in the views of our majestic mountains and the glassy waters of the Pacific Ocean. Breathe in the salt air and leave all of your cares behind! Stop by Stearns Wharf, Urban Wine Trail, Funk Zone, State Street/downtown area - shops and dining, Santa Barbara Museum of Art, and Santa Barbara Zoo! Flying into town? LAX is 95 miles south + the Santa Barbara Municipal Airport is 10 miles north! Pool, Wifi, Gourmet mini-bar snacks and beverages, Room Service, Spa Beaumontia - offering facials + massage, Jacuzzi, Dry Sauna, and a luxurious Pool Bar!